"Exact repro of this utterly cool US album from 1975. 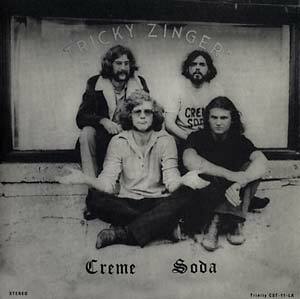 Championed by the great Greg Shaw of Bomp Records, Creme Soda were one of those amazing anomalies: a band from 1975 playing garage-psych music which sounded straight from 1966-67. A very eclectic album which runs the gamut from psych-fuzz rockers to mellow deamy psych, garage R&B and Velvet Underground influenced acid-psych. Not forgetting the killer 'Chewing Gum,' a proto-punk track which sounds like early Cramps! Perfect remastered sound, original artwork and labels."